The fourth book in the recently reissued Nantucket mystery series. Merry Folger is more than ready for a romantic vacation with her fiance Peter when fate--and her police chief father--intervenes. Twenty-one-year-old Jay Santorski never should have drowned in the frigid waters off the Nantucket shore. What was the athlete, Harvard scholar, and part-time scalloper doing out alone in the storm-churned bay? At her father's insistence--and over Peter's objections--Merry returns to the island to investigate, only to be confronted at every turn by false leads and dead ends. And Police Chief John Folger is behind too many of these roadblocks. For the first time, Merry begins to feel she cannot trust her lifelong role model--her own father. Follows a successful laydown of the first book in the series that will continue to perform as a Passport to Crime selection. A fifth book in the series, the first new entry in more than 15 years, is planned for Fall 2017. The Nantucket Book Festival each June shows how well-read the area and visitors are. 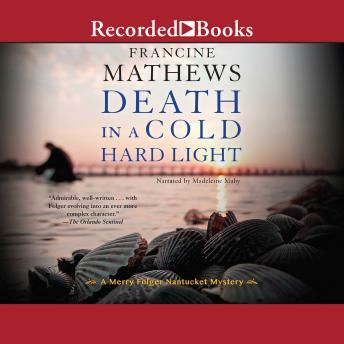 Praise for Death in a Cold Hard Light: "An admirable, well-written series, with Folger evolving into an ever more complex character as love and loyalty collide with her professional pride and ethics." --The Orlando Sentinel "Mathews writes appealingly, making her characters human, fallible, and thoughtful and her story line always believable. Essential for all mystery collections." -- Library Journal "Dark, taut, and unsettling... a nail-biting pace." --Booklist "Atmospheric... Action-filled." --Publishers Weekly Series Overview Following in the footsteps of her father and grandfather, who both held high positions on the local Nantucket police force in their day, 32-year-old detective Merry Folger must go the extra mile to prove her promotion to detective isn't just nepotism. About the Author/Illustrator Author Residence: Denver, CO Author Hometown: Binghampton, NY Francine Mathews worked for four years as an intelligence analyst at the CIA. She wrote her first book in 1992 and left the Agency a year later. Fifteen books have followed, along with sundry children, dogs, and houses. When she's not writing, she likes to ski, garden, needlepoint, and buy art. Marketing and Publicity Publicity continues to be about the reprints leading up to the publication of a new hardcover later this year. Digital and social marketing targeting Cape Cod and Nantucket readers.